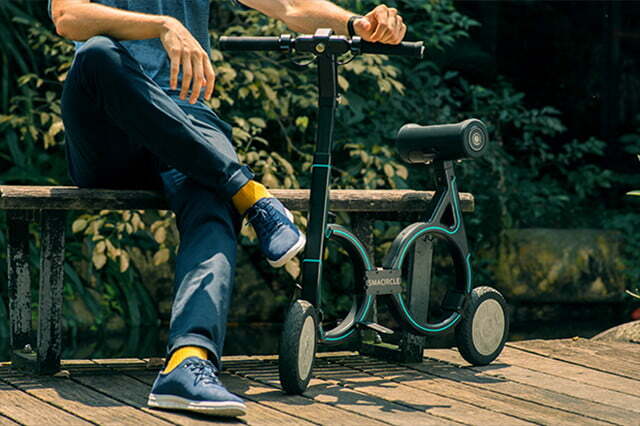 The Smartcircle S1 is a foldable electric bicycle that is small enough to fit into a backpack. The bike weighs 15.4 lbs and can be folded in five simple steps. The bike is perfect for taking on public transportation for a long distance travel. If the distance is long to walk but too close to drive, this bike does the work for you. The bearing of the bike is constructed with premium carbon fiber, but it is strong enough to undertake 220 lbs (100 kg). The height of handlebar and saddle can be adjusted so it fits your needs. The bike is only 19 x 7.5 inches while folded, so you can easily put your bike in a backpack. It has custom solid damping tires that have advanced wear resistance, allowing an easy ride on uneven roads. For safety measures, the electric bicycle is equipped with front and rear LED light. The electrical bicycle is equipped with a 240 W brushless DC motor. It can cruise through the city at 12 mph at up to a 15° angle. Additionally, the bike is equipped with electronic brakes for safer and faster braking. It can safely stop in 4 meters at 12.4 mph. A lithium-ion battery from Samsung is used in the bike and offers a range of approximately 12.4 miles. 2.5 hours are needed for a full charge. The Smartcircle S1 is completely street legal and you can drive it even without a road license. Additionally, the bike is equipped with cool features such as in-built USB charger, mobile phone holder, dedicated mobile app and security lock. Talking about the mobile app, you can monitor and adjust speed, lock and unlock your electric bicycle , adjust the light, speed and monitor the battery life. It also monitors your average and max speeds during your trip. The Smartcircle S1 will cost you $999 and can be ordered from the developers’ website. Do your writers know you have an international audience who speak only educated measurements?